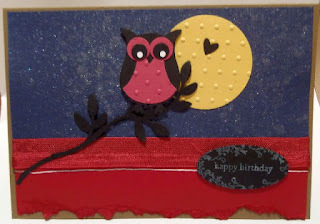 This was my May 1st Class card and I so enjoyed making a sparkly background for this little night-owl, that I have issued an Owl-ish challenge at PaperCraftCentral this month. Do you know some cool ways to make a night scene for an owl to adorn? I used my Owl Builder punch from Stampin' Up! to make my own night bird, and sat him on a branch cut with the Bird Punch. It's fun to make these little guys. PS: Card CASED from Adele Suda. Thanks, Adele! Easter Greetings with Varied Vases.